No Fenders -Formula 1, IndyCar and A Whole lot more..: May be IndyCar Should Create A New Triple Crown? Yeah, I know we've Moved On from the euphoria of Indianapolis and it's 500 mile race, to those riveting Belle Isle Bumpfests' and the final ABC IndyCar TV Broadcasts; HURRAH! 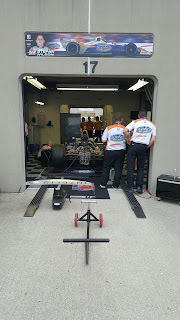 Yet I cannot say how excited I got when Stefan STORK' Wilson made in thou words of Indy Cars eldest Blogger: "A legitimate Pass for the lead on Lap 193." That perhaps I could once again witness in person the Unbelievable happen at Mother Speedway a la Alexander Rossi's improvable victory two years ago. Yet we All know it wasn't meant to be, and whilst Will Power was a totally deserving winner, which made me Uber' Happy! As he was my No. 2 Favourite IndyCar Driver for years 'N years. Not to mention his electrifying Post-race euphoria! Yet these Days presumably due to My Station in Life, I'm drawn to the 'lil Guys, nee Underdogs and hence I really thought it'd been Hilarious if either Oriol "Suitcase" Servia or Stefan Wilson stole a victory in the Indy 500, with Bloody Jack Harvey ridin' Shotgun. As I found Stefan to be nothing but pure, 100% Class when making his Victory Banquet acceptance speech. As Kudos to the lanky Englishman for being totally Honest when saying he really didn't know if he'd be back next year or not? Whilst he also threw out an interesting trivia nugget when noting how he'd been made aware via TWIT-er' that he 'and his bigger brother, the late Justin Wilson had just become only the fourth ever Brothers to lead laps during the Indianapolis 500. As I started scratchin' Thy 'Ol Noggin', I could only come up with one other definitely correct Pair's names. Whilst the names of Mears, Sneva, Lazier and even Andretti came to mind. As can you name All four Brotherly Duos to do so? Meanwhile, although obviously All of this year's 33 Starters are talented Drivers, you'd have to be impressed with Stefan's performance, especially since he hadn't raced an IndyCar since the 2016 Indy 500; Aye Karumba! Stefan first raced single seaters in the Formula Palmer Audi Series in 2006's Autumn Trophy, where he finished as Top Rookie. The next year, he contested the full season, ironically ten years after his brother Justin had won the first Formula Palmer Audi Championship, scoring four wins, nine podiums and four poles. After finishing runner-up in the '07 Formula Palmer Audi championship, along with being named the McLaren Autosport BRDC's Promising young British Driver, which included a test aboard a McLaren Formula 1 car in '09 at Silverstone. Stefan moved up to British Formula 3 where he finished fourth Overall, again notching another four wins. Stefan next crossed thou proverbial Puddle' to make his Indy Lights debut in a partial season campaign for First Motorsports, whose chassis were prepped by Walker Racing in '09. His best season in Indy Lights was in 2011 when he raced for Andretti Autosport, finishing third Overall behind the Dominant Sam Schmidt Motorsports Juggernaught of series titlist Josef Newgarden and the long forgotten Argentine Esteban Guerrieri. As Stefan scored two Indy Lights victories, first at Toronto and next at Kentucky, where he scored his debutante Pole position on an Oval NO less! Stefan made his IndyCar debut for Dale Coyne Racing alongside his brother Justin at the 2013 Baltimore Grand Prix, where he finished 16th. And after an abortive effort to go IndyCar racing with Fan Force United in 2015, he made his Indy 500 debut for KV Racing Technology in 2016. Then after surely an agonizingly long 24 months wait, he made just his third career IndyCar start, and second Indy 500 start this year, ironically which is his career best finish to date, albeit after leading three tantalizing laps late at Mother Speedway needed to head to the Pitlane for a Slash 'N go, netting him a P15 finish. Thus, like many of the One Offers', it's a shame that Stefan will be most likely looking at sitting on the sidelines for another 12 months, if he's able to find the funding for another crack at Indianapolis? All of which made me think of it's too bad Stefan and others cannot put together a mini version of what FAST EDDIE" does each year, when Ed Carpenter simply runs just the Oval events. Which made me ponder what if the Texas Motor Speedway's 550k Oval race was turned into a 500-miler instead, and along with Indianapolis and Pocono made up a new Triple Crown mini-series, a la the reconstituted short-lived revival by Fuzzy's Vodka from 2013-15. With enough financial incentive to whomever won this Mythical series enabling such drivers as Stefan, Servia, Conor Daly, Pippa Mann and others to contest three races a year instead of just one. Of this Quartet of Brothers, the Unser's should have been the easiest to guess, albeit the Chevrolet's were the first to accomplish this feat. As Al Unser Sr. is the All-time Career Lap leader at IMS with 644, 32-laps more than the legendary Ralph De Palma, whose second overall. Since although "Uncle Bobby," is Al's older brother, and I recently heard Bobby on Speed Freaks mockingly jest that Al Cheated when they asked how come he had four Indy 500 victories vs. bobby's three; Hya! As the Unser brothers are the only duo to both rank in the Top-10 overall for laps led at the Brickyard, with Bobby clocking in at P9 with 440, meaning Al's led more than an entire extra race than Bobby! Both brothers also rank in the Top-10 for career IndyCar wins, with Al currently fifth with 39, and Bobby P7 with 35. One scant W' ahead of some Dude named Will Power. Gaston Chevrolet is the only other Indy 500 winner of these four brother combinations, having won the 1920 International Sweepstakes race before dying at the age of 28 in the AAA National Championships final race at the Beverly Hills Boardtrack, being named the National Champion posthumously. As Historians consider Gaston to be the true 1920 AAA National Champion, despite revisionist History proclaiming Tommy Milton's the 1920 AAA National Champion. As I wonder what 'Ol D-Squared', aka Donald Davidson would have to say on the matter? And the tragedies befalling the Bettenhausen's are too well known by avid Indy 500 Fans, as Tony "Junior" died in a plane accident, whilst Gary passed away at the age of 72 in March, 2014.